A Canadian Pacific Railway freight train eastbound over the Stoney Creek Bridge. Stoney Creek Bridge is a 200-metre-long (656 ft) truss arch bridge in British Columbia, Canada. 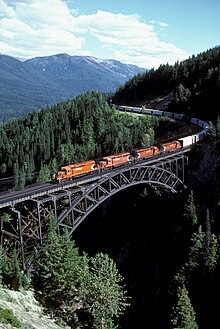 It carries the Canadian Pacific Railway single track of 90 m (295 ft) over the Stoney Creek, between Revelstoke and Golden. A wooden bridge was originally built on the site in 1885, and the current steel structure was built in 1893. A second set of arches was added in 1929 to handle heavier traffic. The original bridge was the tallest wooden bridge in the world at that time. This page was last edited on 13 December 2018, at 17:12 (UTC).